Christine leads the Atmospheric Composition Change Group at the Centre for Ecology and Hydrology in Edinburgh, working on diverse projects, quantifying processes and impacts of current air quality. Her research interests cover both rural and urban air quality including long term, high ammonia measurements. She also participates in the UNECE Task Force for Measurement and Modelling, and the CEN WG11 ambient ammonia passive sampling standard. After studying for an undergraduate degree in Metallurgy and Science of Materials, Christine immediately began her MSc in Environmental Analytical Chemistry. After working for a few years at DERA (now DSTL), Christine undertook a PhD on the phase of tropospheric aerosol particles with Professor Jon Abbatt in Chicago and Toronto. After four years as a PDRA, Christine began working at the Centre for Ecology and Hydrology, where she has now been for nearly ten years. During this role, she took on the coordinator role for the 2009 Defra UKEAP network consisting of four background air quality monitoring networks and two rural UK air quality supersites. Christine has been a member of the IES for over 10 years, having regraded to Full Member in 2014. The diversity of the IES mirrors Christine’s own work, with the most interesting aspects of her role being the interface between fundamental science, applied science, and policy. The position she holds currently also allows her the freedom to leave the desk and find herself immersed in a wide range of environments, one day she could be working on a chicken farm, the next, discussing approaches to global-scale affairs. Christine is currently enjoying the challenges of the Defra UK Eutrophying and Acidifying Pollutants contract, bringing rural background monitoring sites and supersites, such as Auchencorth, together. In this role, Christine maintains a network of over 100 sites, delivering quality-assured data as well developing the scientific principles such data underpins. With a range of consultants, professional organisations, and citizen scientists, the air quality networks are always evolving and require stringent reviewing to ensure the data is both consistent and useful. 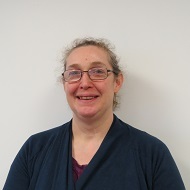 Christine is looking forward to working with the newly developed Atmospheric Composition Change Group in shaping their joint research plans in the coming months. Alongside this, she hopes to continue implementing cutting edge instrumentation and samplers to the network as and when they become available whilst also planning to write more research papers and spend more time in the laboratory with students.